We may be a small operation, but we've got lots going on. Our schedule is chock-full of fun and unique special events, and we're always adding more. 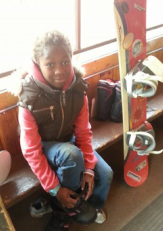 Join us for our annual Ski & Snowboard Swap. Generally held the first Saturday in November, the Swap offers a chance for local gearheads to trade-in or trade-up. The Ashwabay Outdoor Educational Foundation(AOEF) keeps 15% commission from the purchase price, and sellers keep the rest. Cross-country, Downhill, and Snowboard equipment are all welcome. Watch our Calendar, and our Facebook page for updates. Our popular Holiday Mini-Camps offer a chance for youth to learn a skill, and opportunities to grow and improve. 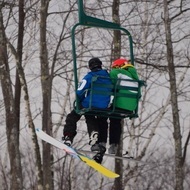 We gather instructors to help with beginners in either our Learn-to-Ski Camp or our popular Learn-to-Board Camp . The Chequamegon Area Nordic Ski Club is a partnership between Ashland and Bayfield County 4-H and local schools. 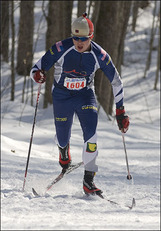 Their mission is promoting fun, fitness, safety and excellence in the lifelong sport of cross country skiing. 4-H CANski provides ongoing instruction, social opportunities and leadership development for all levels. We emphasize technique, conditioning, safety and provide leadership opportunities in a fun filled atmosphere in the great outdoors. 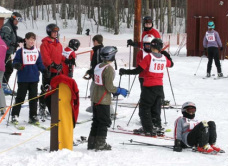 Mt Ashwabay is open for skiing and boarding Saturday nights from 3-8 pm, and several local businesses have offered to subsidize the cost of rental and tickets for youth grades 6-12. 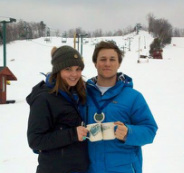 With their help, we are able to offer $10 lift tickets with FREE rentals. Come on up and enjoy winter! 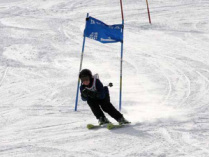 NASTAR (National Standard Racing) is a great opportunity for participants of all ages to race a giant slalom course and compare results to others in their age category across the nation. Participants ages 12 and under race free thanks to generous support from the Rychel family. 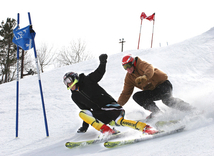 NASTAR is open to Alpine Skiers, Boarders, and Telemark Skiers. We always appreciate assistance setting up and tearing down the course, so arrive a little early or plan to stick around afterwards if you have time. Racing NASTAR is a great opportunity to have fun in a non-competitive atmosphere. Accumulate points all year, because awards will be given at the end of the race season to the top three racers in each age group. Bring a friend and challenge each other for the fastest time every Sunday all season long at Mt. Ashwabay! 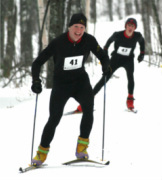 This Race offers a 3.5k youth, 8k/11k adult pursuit race (this is worldcup style, transition area to switch skis and poles), 8k adult classic, 11k adult skate, and 0.5k kids (8 and under) fun race. Classic and skating lanes are provided throughout the skate courses. Middle School and High School racers are encouraged to do the 3.5k race. Home-baked cookies go to all finishers. The overall male and female winner of each race receive a homemade pie or plate-sized cookie bar. We have a variety of talented instructors with years of experience available, so whether this is your first time on snow, or you’re looking to take your skiing or snowboarding to the next level, a Lesson is a great way to go. We are happy to schedule lessons for large groups. 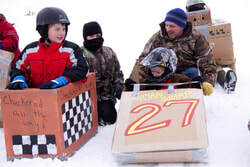 The annual Rychel Cup Race Series is open to all skills and all ages. Racers compete in 2-Slalom, 2-Giant Slalom, and 2-Super G events, with the best 4 of 6 runs scored. Winners are declared in seven Men's and Women's categories. As we herald the coming thaw, we express our appreciation for the winter. The weekend is chock-full of fun and crazy events like Water Balloon Launch, Park Contest, Jump Contest, Speed Race, Costume Contest, Pasta Potluck, and the ever-popular Cardboard Races.